After traveling to Scotland in 2004, I became interested in the Architecture of Art of Charles Rennie Mackintosh which was especially evident in Glasgow. Mackintosh was a ‘total’ artist. He not only created unusual and unique buildings, he designed furniture, friezes, watercolor paintings, stencils, fabrics, and tiles. He seems to visualize not only the outside (the building) but the interior within that building. 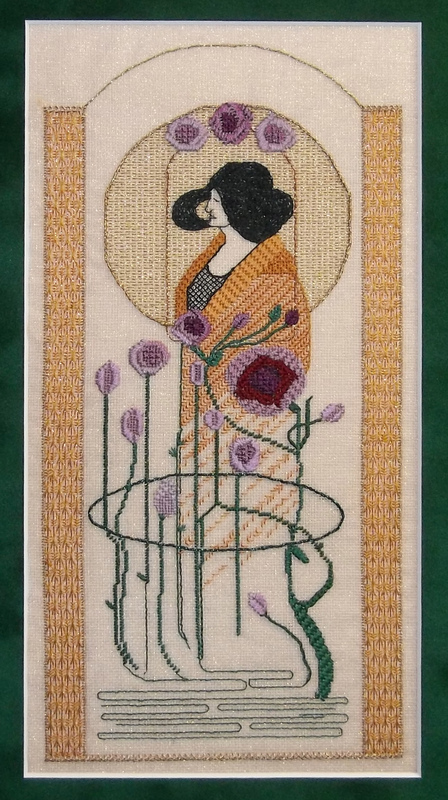 This embroidery is entitled, “Part Seen, Imagined Part” and is adapted from one of Mackintosh’s paintings. Charles presented this token to Margaret as a key statement of his commitment to her – seen and imagined, four years before their marriage. I contains more layers than meets the eye, with the plant’s femininity only revealed within the light of the masculine sun. She treasured this gift all of her life. Roses and willow leaves are featured in many of Mackintosh’s paintings and have been included in this one.